Contact us, we’re waiting for you! Here we are at the contact page of Casa Bonita Menorca. 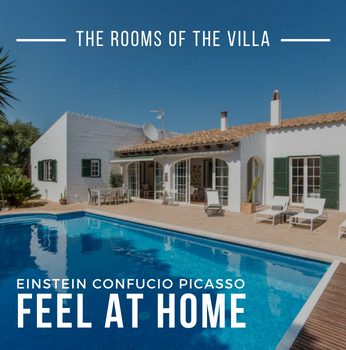 Imagine us being close to computers and smartphones ready to answer all your enquiries and take bookings… Be careful, however, this won’t be your average stay in Menorca. Wait for the unexpected! Where is Casa Bonita in Menorca? A villa with swimming pool, a charming bed and breakfast, a maison d’hôtes with 3 bedrooms. Junior suite with double bed (160×200 cm), single bed (90×190 cm) and en suite bathroom with bath/shower. Double with two single beds (90×190 cm) or a King Size double bed (180×190 cm) and en suite bathroom with shower. Double with double bed (150×190 cm) and en suite bathroom with shower. You are more than welcome to Casa Bonita!